There are some days where at the end of the day all I want is something simple for dinner, but tastes like I put a lot of effort into it. Simple to prepare, but not so simple that it’s boring. Something with great flavor, will look pretty, and be healthy too. I was looking at what I had in my refrigerator for inspiration. I bought a bunch of eggs at Trader Joe’s (4 dozen to be exact. Totally not a lot, right?) and they were taking up a lot of room in my fridge. So I thought I’d make something with eggs, especially since I love them. Then I saw some asparagus. Fritatta? I wasn’t feeling it. Whatever I was going to do with the eggs, I wanted to be able to break into the runny yolk. 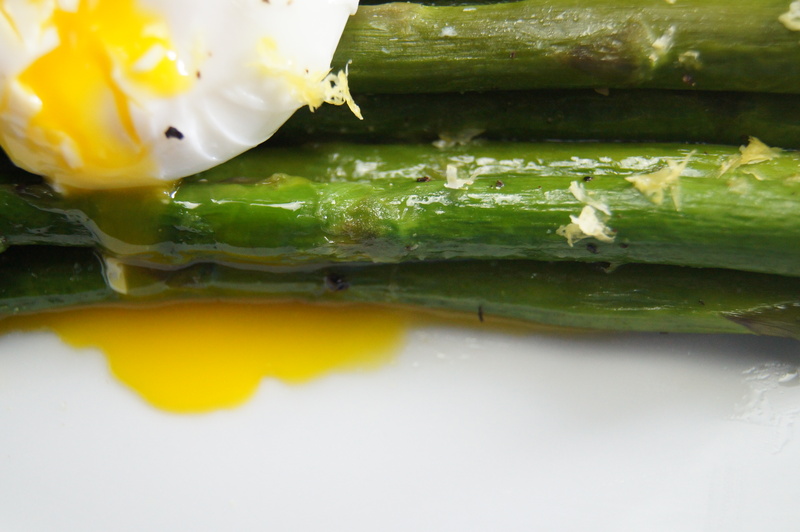 And just as I thought that, I got an image of the yolk dripping down the asparagus – and boom! This recipe is exactly what I knew I wanted to make and eat. It was so easy to put together and really delicious. It came together in minutes and had virtually no prep work. I wish I had thought about this recipe when I was in my 20s, before I had children, and when it was just me (and my sweet, beautiful cats, Mimi & Phoebe) for dinner when my husband was away traveling. I remember during that time, I would come home from work and want to make something like a stir-fry or risotto for dinner. But just the thought of the prep work and clean up made me tired, so I’d make an exciting plate of scrambled eggs for myself. I remember having scrambled eggs, a glass of wine, and watching Beverly Hills 90210 and thinking, “This is the life!” For special occasions though – like when Dylan got married – I would up the ante on my scrambled eggs and make a cheese omelet. Did I really just admit that out loud? By the way, my cheese omelet at the time was very much like Dylan’s short-lived marriage: a disaster. It would always start off with good intentions of being an omelet. But in the end it was just scrambled eggs with cheese. It was total mistaken identity. Again, just like Dylan’s short-lived marriage. I’m glad that my taste in a simple, but flavorful, dinner has grown up a bit. My tastes in TV, not so much (I just got caught up on The Real Housewives of New Jersey and I cannot believe what is going on. What is wrong with Jacqueline?!). In a straight-sided skillet or pot, boil about 2 inches of water. While you wait for the water boil prepare a large saute pan. Heat the pan with olive oil over medium heat. Once the water comes to a boil increase the heat of the saute pan to medium-high. Add asparagus to boiling water for 1 minute to 1 and half minutes, depending on the thickness of the asparagus. Keep the water boiling. As soon as the minute, or minute and a half are up, remove with tongs and let excess water drip. Add the asparagus directly to the hot saute pan and season with salt, pepper, and garlic powder. Let sear for about a minute or two. 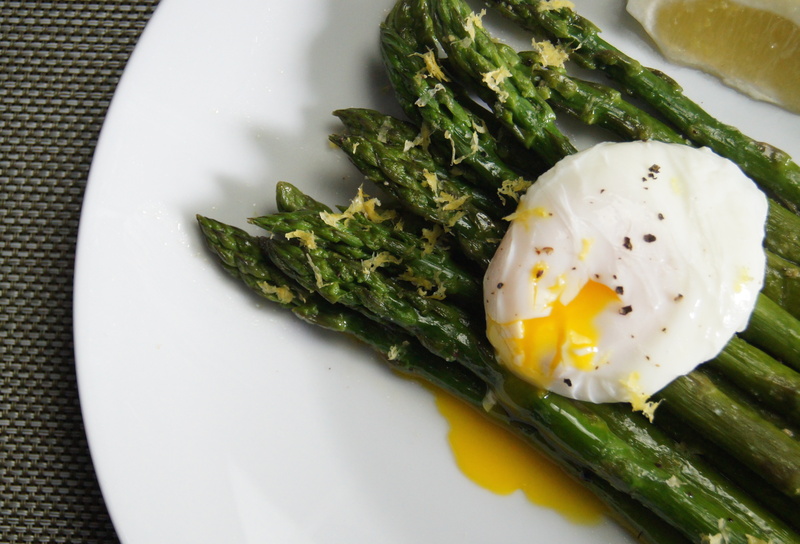 Transfer asparagus to a plate. 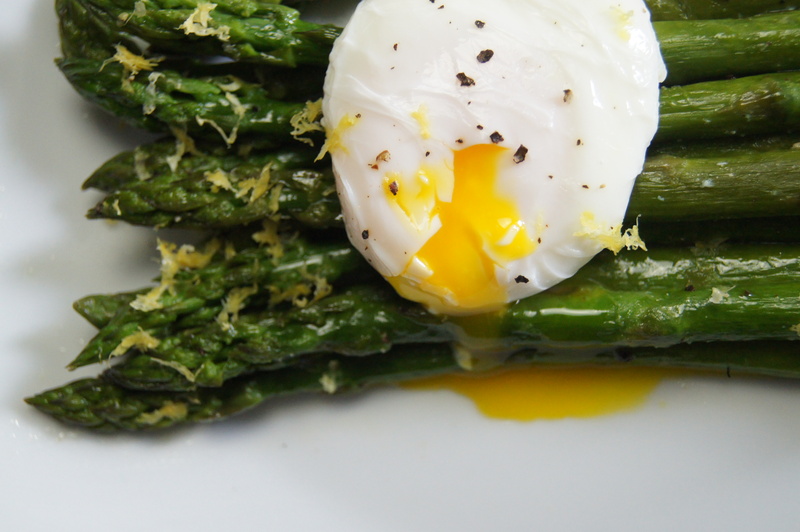 Put a whole, un-cracked egg on a slotted spoon and place egg in the boiling water for 10 seconds. Remove the egg and crack into a separate small bowl. Repeat with second egg. Bring the water to simmering and add eggs gently back in the water, making sure not to crack the yolk. Poach for 2 minutes. 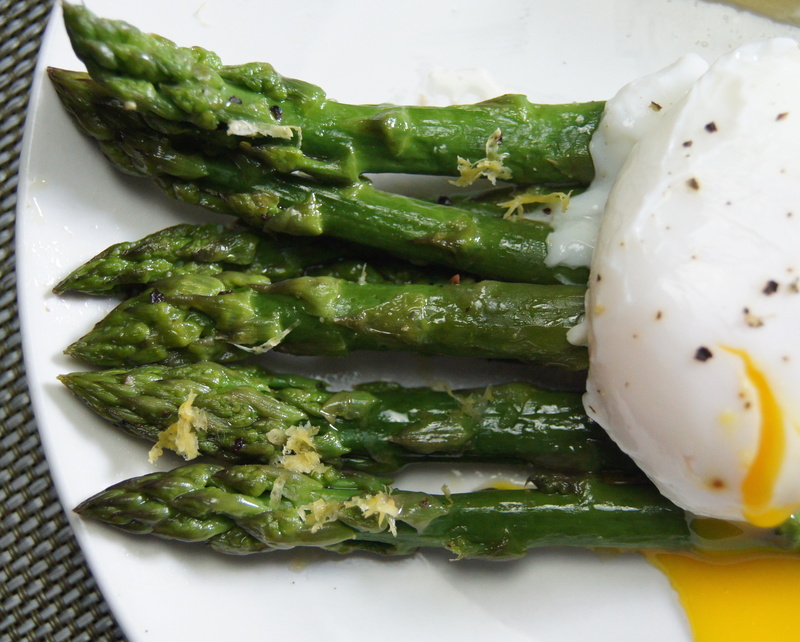 Remove eggs with a slotted spoon and place poached eggs on top of asparagus. 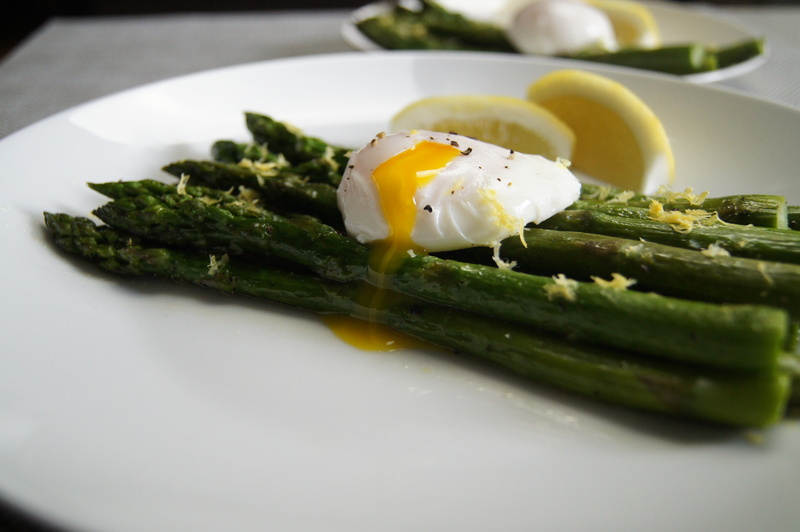 Sprinkle poached eggs and asparagus with lemon zest and freshly ground black pepper.